What's the biggest advantage of hose reel carts over regular hose reels? Mobility! Apart from keeping your hose tidy, well-organized and protected, hose reel carts will enable you to conveniently water various spots in your garden or yard without the hassle of dragging around your hose over your shoulder, as long as there are water faucets available. Hose reel carts won't break your back or bank, either. They are affordable and even the top of the range models bring added value: by protecting your hose from kinking, twisting and being stepped on or driven over you will save money on hoses as well. Once you are done with watering your plants, lawn, or washing your car, all you need to do is reel back the hose and conveniently cart it away to your garage or shed. If you're looking for a great hose, check out the best water hoses here. Hose reel cart buying guide– what features to look for? The ultimate hassle-free hose reel carts should be easy to operate and sturdy. The best models are mostly made of metal, non-rust cast aluminum, or durable hard plastic. They should feature brass and aluminum plumbing fixtures and water-tight quality mounting hardware. This is where the main purpose of the hose reels comes into play. The mechanism should be really sturdy and work flawlessly. Welcomed features are safety breaks, a great quality reeling handle and heavy-duty brass fittings and couplers. This feature refers to the total length of the hose (the diameter is also stated) which a particular reel can operate. The capacity varies from 100 to 300+ feet of a 5/8-inch hose. If you have a large garden or yard or if the faucets are not that near the areas you will water, go for models with larger hose length reeling capacity. If you don’t need the hose to be that long, you can save a few bucks by going for a reel hose cart which can take shorter hose. What you need to do is measure your hose and then choose the type of reel cart which can neatly and conveniently store and easily handle the measured length. Don’t forget to make sure not to end up buying a hose reel cart which is too small and cannot take your hose. It’s a bad idea to force the hose into an already-stuffed hose reel cart. Better go for the slightly bigger hose real cart so that it can comfortably fit your garden hose. As we mentioned, the main advantage of hose reels carts over free-standing or wall-mounted models is mobility: you can conveniently wheel them away and store them in your garage or shed. This is why quality wheels are important. The wheels are either made of hard rubber, plastic or rubber inflatable pneumatics. Of these three options, I prefer the rugged flat-free tires which will outlast the plastic or inflatable wheels. While inflatable rubber wheels are certainly more comfortable and offer less bumpy carting experience, they are prone to punctures. There are, however, solid quality plastic wheels with plastic axle but you still can’t expect the same durability as with hard rubber wheels with the metal axle. The size also matters: the bigger the wheels, the more stable the cart will be on rugged terrain. In addition, the number of wheels is also important. The most stable carts are with four wheels. They are also the least tiresome to cart around your yard but the two-wheel models are definitely more maneuverable. What you do is simply connect your garden hose at the base end and whenever you need it, you just uncoil it from the reel, do all the watering chores and then wind the hose up using a crank or button, depending on the model you chose. How big hose reel cart do I need? All you need to do is measure the hose and choose the type of reel which can neatly store and reliably handle the measured length. You need to make sure that you do not end up getting a hose reel that is smaller than your hose length. You don’t want to force the hose into an already-stuffed hose reel, so although it goes without saying, choose the hose reel which is big enough, or even slightly bigger so that it can comfortably fit your garden hose. Rapid Reel Two Wheel Garden Hose Reel Cart from Eley is a great choice for getting the much-needed mobility of your garden hose. This horse reel cart will enable you to water your plants with next to no effort, and a minimal wear and tear on your shoulders and back. The Rapid Reel cart comes with an easy crank to coil your hose effectively and neatly, and a convenient cart that goes where you want it. You will also save a few bucks on garden hoses, as this hose reel cart keeps hoses organized and free from kinks and tangles. The assembly of the Eley Rapid Reel hose reel cart is simple, and takes up to half an hour. All you need is a wrench to connect the parts together using screws as no drilling is required. First, you need to sure to attach the knob, cam break, and axle to the flanges. For better tightening, you should apply a small amount of oil into the aluminum coupler’s thread. Finally, the last step is to install the hose and the nozzle and you can start washing your car or watering your garden. As for the construction and the design, this reel is bound to last for a very long time as it is robust, heavy and extremely well-made. Made of die-cast aluminum, and featuring a brass swivel, it’s the perfect choice when it comes to durability as well as mobility while keeping your watering gear organized around your driveway, garden, yard, or a lawn. A very useful feature is the cam brake. It prevents the reel from free-spinning when you are pulling the hose out. Because the motion is so effortless, without a cam brake to slow it down, you would pull the entire hose out. After turning the brake off, you can reel the hose back in smoothly and conveniently. Make sure to get the hose is straight before starting to reel it in, and it will reel in properly. The hose will not kink easily when rolled back in, and the cam break will lock the flange and the axle together to prevent the hose from unwinding itself. Your hose can easily be removed from the cart reel for easy cleaning of the hose and the cart. A cotton cloth or a pressure hose can remove the dirt that sticks on the cart and the hose. Make sure to provide proper storage for your hose reel cart at the end of the season. If you’re going to keep the hose on your reel cart, make sure you drain it completely. This will increase the durability of your hose real cart and your hose for many seasons. Overall, the Eley Hose Reel Cart Rapid Reel is well-built with puncture-proof tires, a front bumper, and cam breaks. This is a high-end garden hose reel cart which can easily be wheeled where ever there's a water faucet so that you can water your garden or lawn without difficulty. Strongway Garden Hose Reel Cart features a durable tubular steel frame and heavy-duty brass fittings and couplers. It has the capacity of up to 400 ft. of 5/8in. hose and even comes with a conveniently integrated basket to store accessories.This cart from Strongway comes with a welded handle with swivel grip for easy hose winding and unwinding. The durability and functionality are further ensured by the solid steel axles and puncture-proof 10-inch tires that don't need to be inflated. The pull-behind handle design allows for convenient wheeling while the integrated basket provides storage for hose nozzles and other accessories. In addition, the heavy-duty swivel grip allows for easy winding and unwinding. This is a portable unit which makes it easy to get the hose right where you need it. The extra-large capacity cart can hold up to 400ft. x 5/8in. garden hose. It actually looks good, too, so it will be a cool-looking and quality addition to everyone's garden. The Strongway Garden Hose Reel Cart is perfect for homeowners, gardeners, landscapers, and anyone who needs quite a long hose reel cart which will be portable and help make the garden or yard a safe and organized workspace. To sum up, the 10” flat-free tires with solid axles make the Strongway Garden Hose Reel Cart roll smoothly for easy maneuverability, even on rough terrain while the heavy-duty tubular steel construction with a corrosion-resistant powder-coat finish ensure durability. Definitely a great hose reel cart for the money! 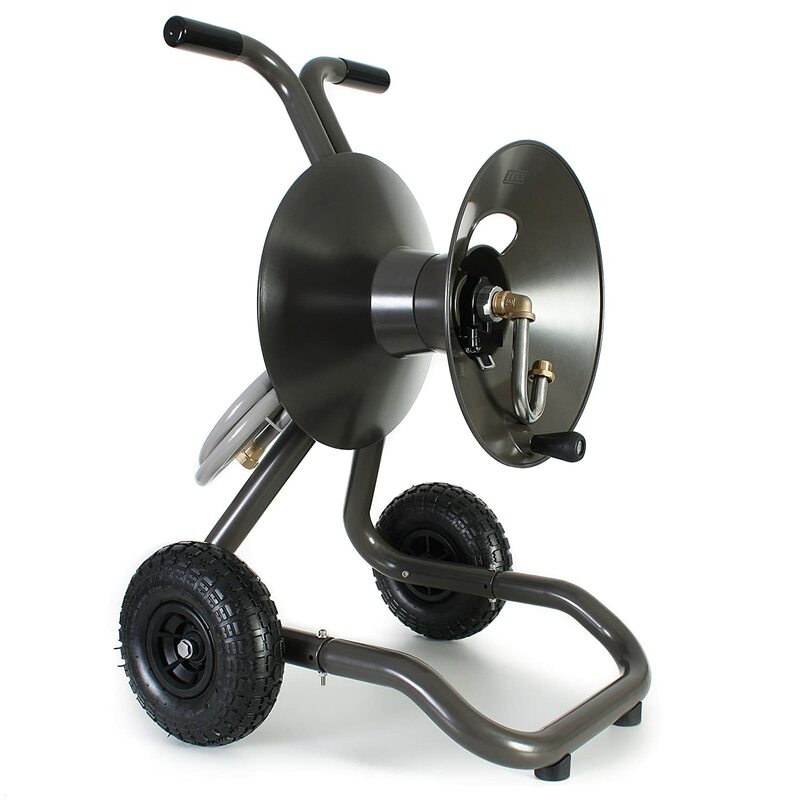 Free Range Heavy Duty Steel Hose Reel Cart is another heavy-duty unit made of 13-gauge steel. The tubular construction makes the1.5-inch frame lightweight and easy to maneuver thanks to the 4 pneumatic tires. Unlike the previous two models we reviewed, this hose reel cart from Free Range doesn’t have flat-free tires. This makes it prone to punctures but this is outweighed by the fact that the pneumatic tires make it much more comfortable to maneuver the reel with a hose on, especially on the bumpy terrain. Some assembly is needed but nothing too complicated. In about 30 minutes you will have a truly well-made hose reel cart capable of holding up to 250-feet of 5/8-inch hose, which is more than enough for the average homeowner. This hose reel cart is manufactured using high-quality materials and reliable components. It’s super-handy to have if there are multiple outdoor faucets in your garden. You simply move the reel cart to the nearest available water faucet, attach a hose and water the area. Once you’re done, all you need to do is reel in the hose, detach it from the faucet and wheel the Free Range Heavy Duty Steel Hose Reel Cart to the next spot. You will certainly appreciate how comfortable the 4 pneumatics are for convenient wheeling. Another great feature is the integrated basket for various accessories needed when watering. The 5-foot inlet hose is also included in the purchase. Apart from being a portable hose reel cart, the Free Range Heavy Duty Steel Hose Reel Cart also looks great and promises durability. It can easily be stored away in the winter which will certainly prolong the life of the cart and your hose, as long as you don’t forget to drain it, dry it and clean it before putting it away. Suncast Hosemobile Pro Hose Reel Cart features a 225 ft. of 5/8 in. standard vinyl hose capacity comes in a light-weight build and at a budget price. The Slide Trak™ hose guide makes winding and unwinding your garden hose super-easy. In addition, the new water flow system constructed of No-Leak aluminum guarantees no leaks. The connections and leader hose are solid quality and the top handle is a convenient feature. This hose reel cart is lightweight, which is great when moving it around, especially for the ladies and the elderly. This hose reel comes with a leader hose and features a manual crank, all fully assembled. Its resin construction should make the reel more durable and longer-lasting for seasons on end. However, you may need to support it with your foot at times when winding and unwinding the hose. With compact dimensions and 2 hind wheels, this unit from Suncast is highly portable so you can easily move it from faucet to faucet if you have a bigger garden. However, this hose reel cart has no axle through the wheels. Instead, the wheels simply snap into place in the plastic on each side of the cart. A certain degree of wobble is expected to develop over time, especially on rugged terrain. This unit is more suitable for gentle lawns and concrete paths and driveways. In addition, the cross-support behind the wheels is quite low at the bottom which makes it a little difficult to pull across the yard if the grass is more than about 1/2" tall. Suncast Hosemobile Pro Hose Reel Cart is otherwise of decent quality for the price and will come in handy for hobby gardeners. Due to the fact that it’s resin and not metal construction, a lighter hose is a recommended option. Liberty Garden Products 870-M1-2 Industrial 4-Wheel Garden Hose Reel Cart is a quality, multi-purpose hose reel cart which meets the domestic, professional or commercial watering needs. It's made of 13 gauge steel and features powder coat finish which makes it weather resistant so you can use it at all times and in all weather without storing it away daily. The brass/galvanized fixtures help carry the weighty hose lengths up to 300 ft. of ⅝” hose. The 90° brass swivel connector successfully keeps the cart one step ahead of other models in terms of extending the lifespan of the hose. This is because it allows the hose to swivel without any kinks or tangles. Very few carts out there have anti-slip handle features but this unit does. This cart features non-slip handle which will prevent slipping and make wheeling and maneuvering the cart safer and more convenient. While wheeling this cart, its four 10" pneumatic help avoid tipping over, due to the low center of gravity. 1 Hose reel cart buying guide– what features to look for? 2.4 How big hose reel cart do I need?